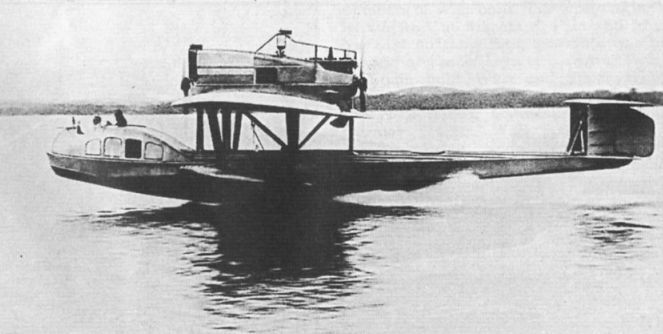 This machine is a monoplane flying boat built throughout (except the wing covering) of steel and alumin. alloy. It shows the lateral fins or stabilisers employed in earlier types, and has tube lift bracing, but the power plant ДальшеMore>>> consists of two engines only, 260 h.p. 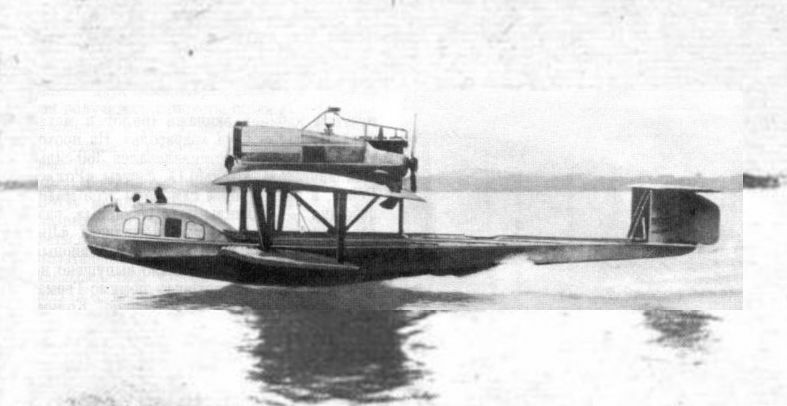 Maybachs, mounted above the wing, tandem fashion, and driving tractor and pusher air-screws respectively. The front engine has a nose radiator, but the rear one has its radiator mounted above the engine housing, as shown in the illustrations. The cabin, which is quite a small affair, is added in the nose of the boat, a position in which, it will be seen, it was necessary to terminate it in front of the tractor screw. Owing to its small passenger accommodation this machine is scarcely such a pronounced commercial type as is its successor the Do. Gs. II. The machine was sold to the Swiss Ad Astra Co., and did a lot of flying in the autumn and winter of 1919. During the course of nearly two months of this period the machine was never once housed in a shed, and it is claimed that no adjustments or repairs were necessary. By way of illustrating the strength of the construction, the makers relate that once, while on a visit to the German Naval Air Station at Noderney, the machine was left sitting on the beach at low tide, when a gust of wind picked it up, and after lifting it several metres into the air deposited it none too gently on the beach 30 metres away from its original mooring. The hull was not strained in the slightest. It has already been mentioned that the wings of the Do. Gs. I are fabric covered. This is the standard covering, but if desired metal covering can be supplied, in which case the useful load is reduced by about 400 lbs. This is, of course, a rather serious addition to the structural weight. This machine appears to have the same facility for leaving the sea without any spray as had earlier models, as will be seen from one of our photographs. Incidentally, from this photograph, which shows the machine from the side, one would be inclined to think that the hull shape was such as to cause porpoising, but as to whether or not this was the case we have no information. The latest model to be turned out from the Zeppelin Lindau works is the Do. Gs. II, which is a development of the Gs. I. 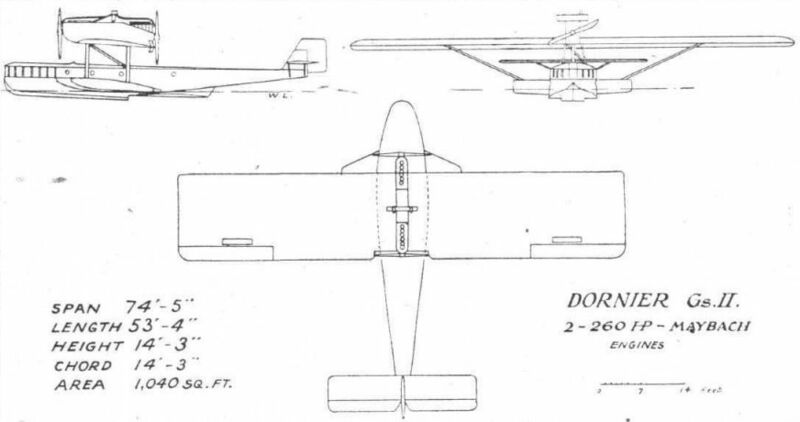 The general arrangement is shown in the accompanying scale drawings, from which it will be seen that the chief alteration is in the cabin arrangement, the roof of the cabin extending aft and passing under the tractor screw of the front engine. This gives considerably more cabin space, seats being provided for seven to nine passengers inside the cabin. The pilot's cockpit is aft of the cabin, and contains two seats, one for the pilot and one for the engineer. Aft of this cockpit is the luggage room and the main petrol tanks. The two engines, as in the previous type, are 260 h.p. Maybachs, and are mounted above the wing. The latter is of similar shape and construction to, although of greater span and area than, that of the Gs. I. Instead of the biplane tail of the Gs. I, the latest type has a monoplane tail. One of our photographs shows the passengers' cabin, which is entered through a door in the extreme nose. It is very comfortable and roomy, and at a pinch nine passengers can be got in without undue overcrowding. The Dornier Gs I taking off. THE DO.GS.I: This boat, purchased by the Swiss Ad Astra Co., has done a great amount of flying, and has given good results. The simplicity of the bracing and the clean general appearance are features of this machine. 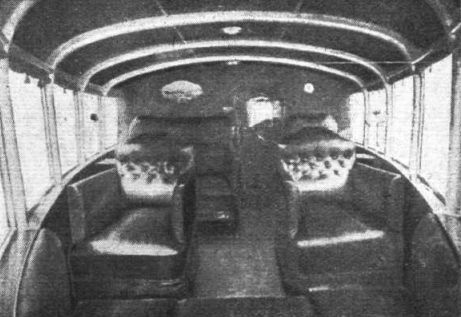 View inside the cabin of the Do.Gs.II, looking aft.